One of the many joys of rigid-heddle weaving is how much easier it is to do fun hand-manipulated techniques such as pick-up. Pick-up lets you create beautiful patterns and textures in you weaving. 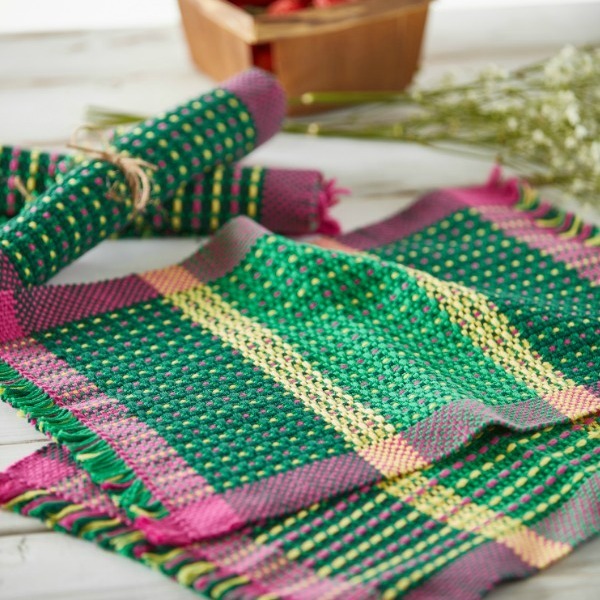 All you need is a pick-up stick or two to create wonderful weaving like Tammy Bast’s Flowers in Spring Placemats. 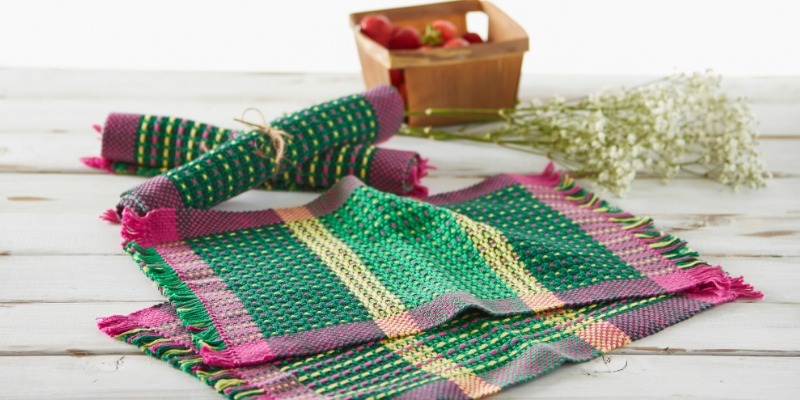 These springy placemats, featured in Easy Weaving with Little Looms 2018, use pick-up to create the illusion of bright pink and yellow flowers on a field of green. This field is surrounded on all sides by plain weave—something not as easily done with multishaft loom-manipulated patterning techniques. With pick-up creating such a gorgeous framed piece of fabric is a snap! I know some folks are reluctant to try pick-up because it seems difficult—I promise it’s really not! And if you want to get started weaving with pick-up, the Flowers in Spring Placemats are a perfect project to teach you the basics. To create the simple patterning of the placemats you only need one pick-up stick which is kept in the warp behind the heddle. No having to reinsert a pick-up stick after every third pick or remembering which is stick A or B. The Flowers in Spring Placemats is an ideal first pick-up project. The pick-up sequence is also easy peasy—just 4 simple steps repeated for most of each placemat. If you can handle moving the rigid heddle up and down after every pick, you can handle the pick-up in these placemats. 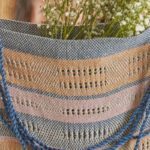 It’s so easy and will have you feeling like a pick-up pro by the time you finish your first placemat and by the time you’ve finished weaving all four you’ll be confident enough to try a more advanced pick-up project. Best of all, you’ll get a set of gorgeous placemats out of the deal, and what’s better than that? Featured Image: Tammy Bast’s Flowers in Spring Placemats use simple pick-up to create pattern and texture. Equipment Needed: Rigid-heddle loom, 14” weaving width; 7.5 dent heddle; 4 stick shuttles; 1 pick-up stick 15”–20” long. Yarns: 8/4 cotton (Maurice Brassard) #1757 Vert Emeraude; #1152 Vert Fonce; #5169 Fushia; #431 Jaune Fonce. Start your Little Looms project today!